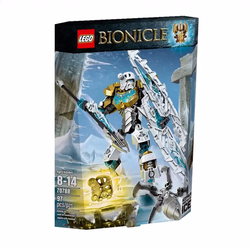 70788 Kopaka - Master of Ice is a BIONICLE set released in 2015. This set was designed by Christian Vonsild. This is a description taken from LEGO.com. Please do not modify it. (visit this item's product page) Ski through an avalanche with Kopaka! Prepare for a chilling mountaintop conflict with Kopaka – Master of Ice! Watch out for the Skull Spider crawling from the snow, trying to pop off Kopaka’s mask. Adjust the arms and legs of this heavily armored figure to create fearsome battle poses. Fend off the evil creature’s attacks with the frost shield, bashing battle arm and the mighty Elemental Ice Spear. Get to the precious Golden Mask first then convert the shield into avalanche skis to escape. Resist the Skull Spider’s attempts to pop off Kopaka’s mask! Combine with 70782 LEGO® BIONICLE® Protector of Ice using building instructions available at LEGO.com/BIONICLE to power up for ultra elemental battle! Facts about "70788 Kopaka - Master of Ice"